Not all those �old days� were good no matter how nostalgic one becomes. I have often said that, �I swore on a hoe handle that I would never farm.� I remember long cotton rows on the Maxey Place along Hog Mountain Road where Oconee Plaza now sits. My father rented a number of farms on Hog Mountain Road and we grew a lot of cotton and grains. Dan Giles wrote an article for the Oglethorpe Echo on June 29, 2006, describing summertime visits to his Great Uncle’s Place in south Oconee County. His description fits a family that was heavily involved in farming in Oconee County for decades - a very prominent and respected family. The scenes Dan Giles described reminded me of many things from my youth in Oconee County. 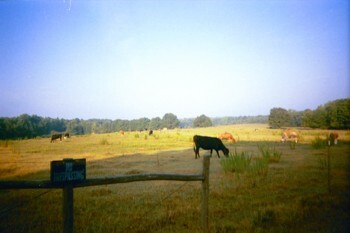 Many of those scenes are rapidly disappearing as cow pastures are replaced with subdivisions. Not all those ‘old days’ were good no matter how nostalgic one becomes. I have often said that, “I swore on a hoe handle that I would never farm”. 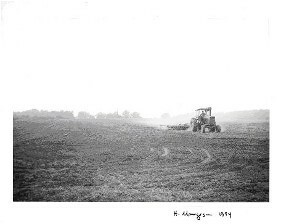 I remember long cotton rows on the Maxey Place along Hog Mountain Road where Oconee Plaza now sits. My father rented a number of farms on Hog Mountain Road and we grew a lot of cotton and grains. One Farm was the Maxey Place, now Oconee Plaza; the Lathan Place, now part of Stonebridge; the McCurley Place, now Lake Forrest Subdivision; the Dellinger Place, now Indian Hills Subdivision and others. We planted about 100 acres of cotton and worked it with tractors and manual labor. We hoed the cotton and picked the cotton by hand. We then hauled it to Watkinsville Gin or to Walt Jones Gin in Statham. We would save our money from picking cotton to go to the Athens Agricultural Fair in the fall. In those days Oconee was really rural and few people really wanted to live here. The Sharecropper population moved to Athens with the advent of public housing. The population went down until the seventies and eighties. In recent years, the farm houses, pastures and cotton fields have mostly disappeared. At least we have our memories- even though we may see them through ‘Rose Colored’glasses! My uncle, actually great-uncle, had a dairy farm in Oconee County before Oconee County became the address of choice. He had 500 or 600 acres running, on the whole, Holsteins with a few Jerseys to add butterfat to the over all mix. Part of a dairy farmer's paycheck comes from the butterfat content of the milk he sells. Or at least it used to; it's been thirty years since I worked in a dairy. He sold his milk to BetterMaid before it became Coble. Usually, once during the summer the entire Giles' clan would travel to the farm for a get together. We'd always carry a covered dish of some kind of food I wouldn't eat until I grew up. The women would stay in the house taking care of the kitchen stuff and catching up on all the news while the men mostly stayed outside doing their own kind of gossiping, but of course what the men talked about wasn't considered gossip. We kids would hang around the edges listening to the men talk about all sorts of seemingly important things but eventually we'd wander off to find some mischief to get into. First, we'd climb onto the tractors. At a young age they looked to be huge monstrosities of green metal and rubber. My great-uncle had only John Deere equipment; he wouldn't buy anything else, tricycle-tired behemoths with the flywheel on the side. We'd act like we were driving them moving the gearshift knobs around, you know, farming. Growing tired of the tractors we'd head for the hay barn where the real fun began. Back then hay didn't come in big round bales like it does today. Back then it was square bales, rectangular in shape, stacked so high it'd take thirty minutes to climb to the top, or so it seemed. We'd play war. We really didn't know what war was but when you got killed you could fall all the way to the bottom, bouncing from bale to bale, sometimes 8 to 10 feet at a lick before you bounced off another bale, at last hitting the ground, which was covered in hay anyway thus making your final death throes more dramatic, and comfortable. The grown-ups would finally call us in to eat. There was every conceivable vegetable known to man, or at least that found in a southern country garden always cooked in fatback, naturally, with more salt than was good for us. Most of the green and yellow vegetables us kids wouldn't eat, but we had to eat some of it. So we settled for the black-eyed peas, com and maybe butter beans along with biscuits that wouldn't fall apart when you sopped up pot likker. There weren't any happy meals or chicken fingers for-us. The barbecue was chicken, cooked on a grill that was actually a 55-gallon barrel cut in half long ways. The sauce was a vinegar, lemon, butter mix with pepper and salt, and every time the chicken was turned sauce was slopped on with what looked like a miniature floor mop. Iced tea, sweet - so sweet it was like syrup - was the drink of choice, no lemon thank you very much. The kids would eat at a different table from the adults; we always finished first and would bug the adults about dessert, but only once, or twice, maybe. Bug'em too many times and you risked not only loosing your dessert but getting your backside lit up as well. Dessert was pea-can pie or caramel cake. We'd get one piece and it was heaven. I think back to those days as I watch my kids playing with their cousins. I hope when they have kids of their own, they will look back on these days as I do those days; thinking to themselves, "We had it made."